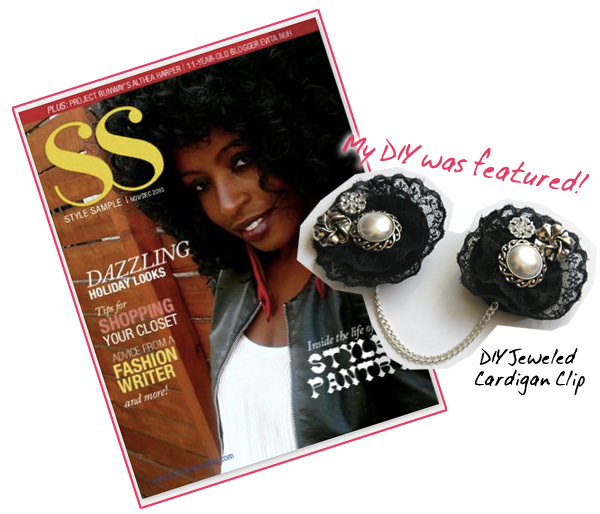 My tutorial for this sparkly, holiday-style jeweled DIY cardigan clip was featured in the Nov/Dec 2010 issue of Style Sample Magazine (see pg. 20!). 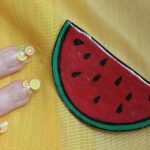 It’s super-easy to make – with just a glue gun, some sparkly buttons, and some trim scraps you too can make one in no time. As the holidays approach, we’re all looking for that perfect accessory to elevate a blah outfit into FABulous; office-wear into party attire; the everyday into elegant. 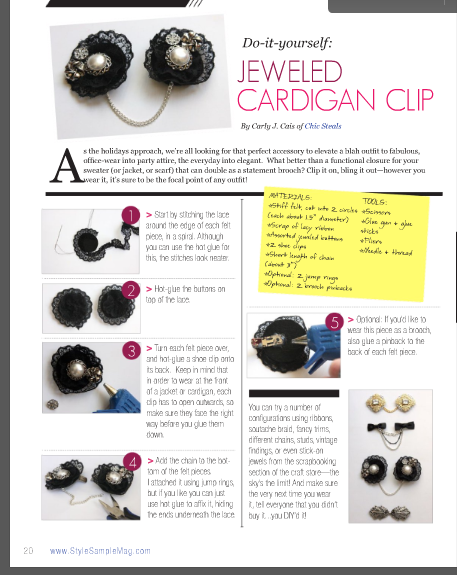 And what better than a functional closure to your sweater (or jacket, or scarf) that can double as a statement brooch? Clip it on, bling it out – however you wear it, it’s sure to be the focal point of any outfit! 2. Hot-glue the buttons on top of the lace. 3. Turn each felt piece over, and hot-glue a shoe clip onto its back. Keep in mind that in order to wear at the front of a jacket or cardigan, each clip has to open outwards, so make sure they face the right way before you glue them down. 4. Add the chain to the bottom of the felt pieces. I attached it using jump rings, but if you like you can just use hot glue to affix it, hiding the ends underneath the lace. 5. Optional: If you’d like to wear this piece as a brooch, also glue a pinback to the back of each felt piece. 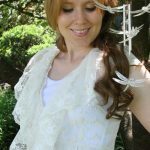 You can try a number of configurations, using ribbons, soutache braid, fancy trims, different chains, studs, vintage findings, or even stick-on jewels (form the scrapbooking section of the craft store!) The sky’s the limit! 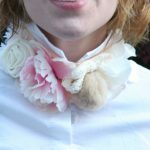 And make sure the very next time you rock it out – you tell everyone that you didn’t buy it…you DIY’d it! Thanks so much to Tamia and the team at Style Sample! I truly appreciate the inclusion and am honored to be a part of this great publication. Congrats! What a great little project. I saw this in the style sample issue love love loved it! I am doing great hope everything is going well on your end of the blogging world!!! 🙂 P.S. 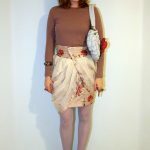 Loved the 30 looks from November!!! !